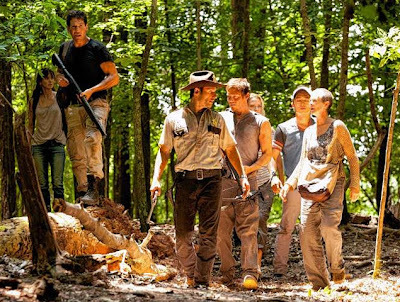 The cast of “Walking Dead” includes (from l.) Lori Grimes, Jon Bernthal, Andrew Lincoln, Norman Reedus, Laurie Holden, Steven Yeun and Melissa Suzanne McBride...or DOES it? AMCs Web site accidentally divulged one of “Walking Dead’s” most closely guarded plot twists — perhaps even the shocking ending of the final episode of Season 2 — in an ad hawking the upcoming DVD box set. Among the highlights of the ad for the $99.99 box set, out in August, is what’s billed as a major character’s last episode. The only problem is that the character is still alive as of the last episode of the show. “The post on the AMC store was completely unauthorized. The matter is currently under investigation,” an AMC rep said in a statement. Speculation, however, had already been rampant that the character, Shane, would be written off, since news broke last month that actor Jon Bernthal was circling “L.A. Noire,” an upcoming TNT series from former “Walking Dead” show runner Frank Darabont. Fans of creator Robert Kirkman’s comic book series, however, have long known that the character’s demise was likely in the works: He’s killed off pretty early in the series run.